The BARD Mobile App developed by the Library of Congress is the app managing files for those registered for the National Library Service for the Blind and Physically Handicapped (NLS). Seeing the apps interface, shows it looks very similar to the actual readers supplied by the NLS. 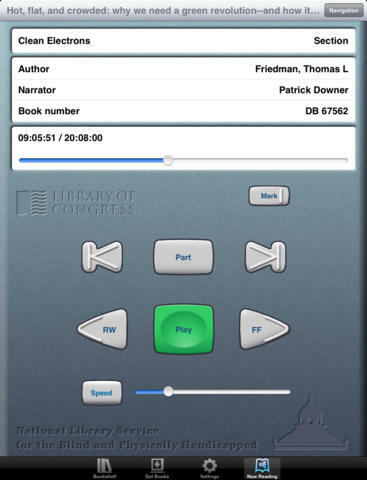 Free and available for iPhone and iPad, this app provides access to braille and talking books directly from the NLS Braille and Audio Reading Download (BARD). This service allows access to 50,000 books, magazines, and music scores in audio and braille formats. Using Bluetooth services on your iDevice, you can also use a refreshable braille display and read the braille materials available on BARD. What a great app making information more portable for individuals with visual impairment. What I know about individuals with blindness is their need to carry with them numerous devices to access information with combined weight of the devices being significant. This app provides additional access to information on an iOS mobile device. More for your teaching, personal or OT mTool Kit! This entry was posted in App Reviews, Apps for Special Needs, Free apps, iOS, iPad, iPhone, iPod, Low Vision/ Blindness, Music app, Occupational Therapy, Reading, Special education, Text to Speech and tagged Accessibility, App Review, iPad, iPhone, iPod, Mobility Impaired, occupational therapy, Visual Impairment. Bookmark the permalink.